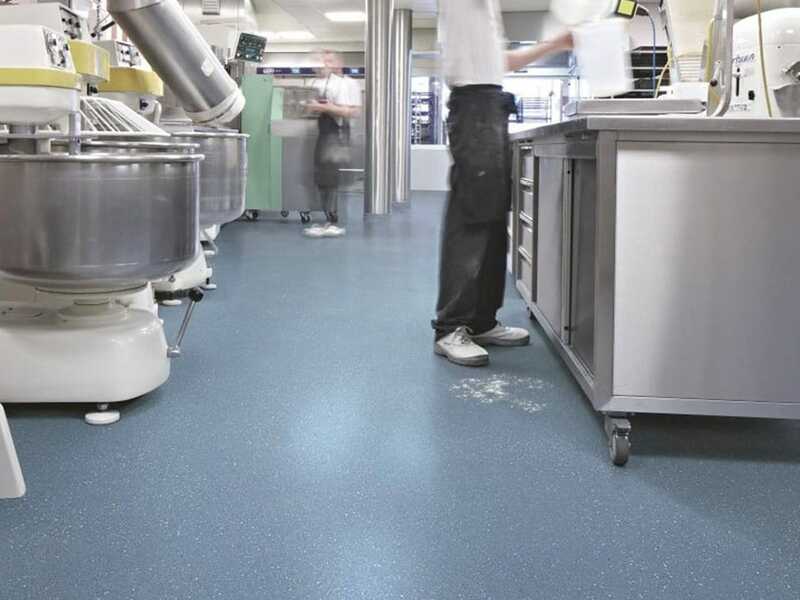 For commercial kitchen flooring we recommend heavy duty safety vinyl. This will create an impervious, hard wearing and easy to clean floor in your commercial kitchen. Stebro Flooring is a family business with over 50 years experience – we have the experience to help you find the perfect flooring to meet the demands of a busy commercial kitchen. 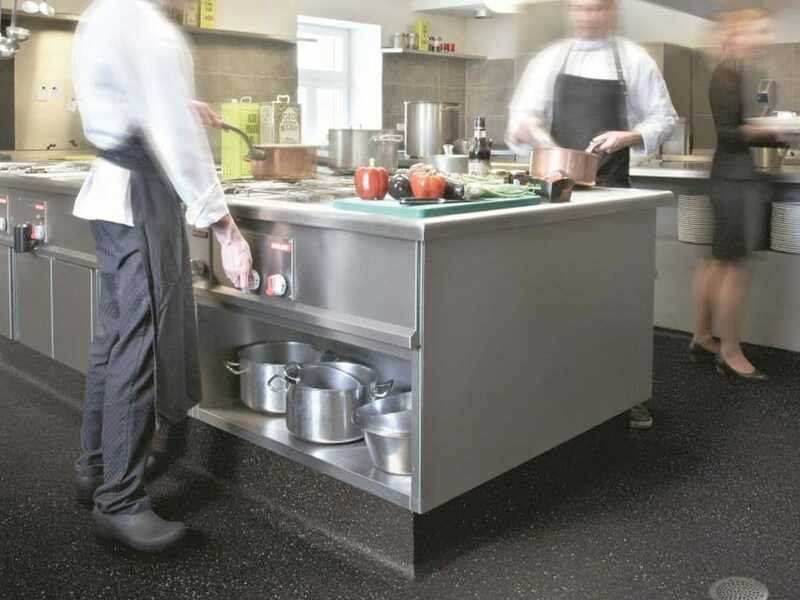 Commercial kitchen flooring needs to be slip resistant, easy to clean, hardwearing and resistant to heat. We recommend heavy duty safety vinyl for commercial kitchen flooring in restaurants, hotels, hospitals, stadiums or arenas and schools. 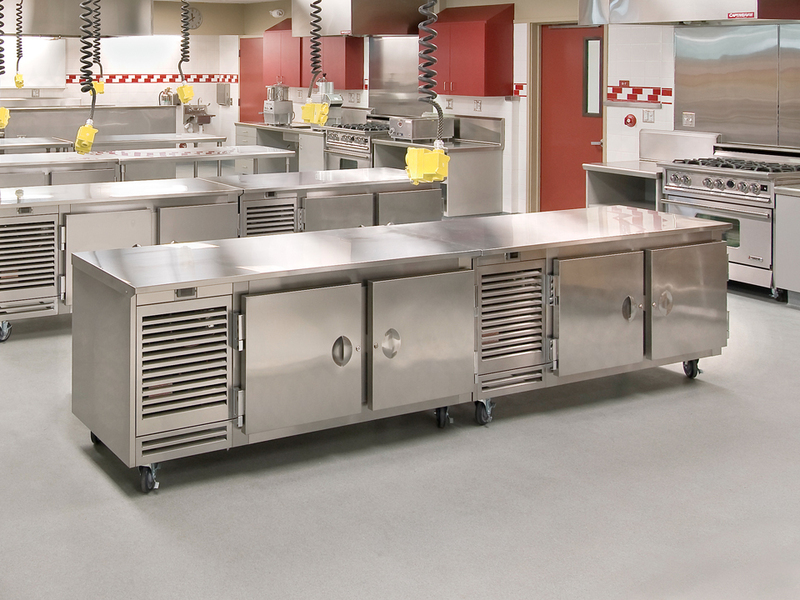 Heavy duty safety vinyl will create an impervious and easy to clean floor in your commercial kitchen. Individual sheets can be welded together meaning the floor is seamless and bacteria has nowhere to collect. Choose a safety floor with a bacteriostatic and fungistatic treatment for a hygienic commercial kitchen floor that inhibits the growth of bacteria between cleaning. 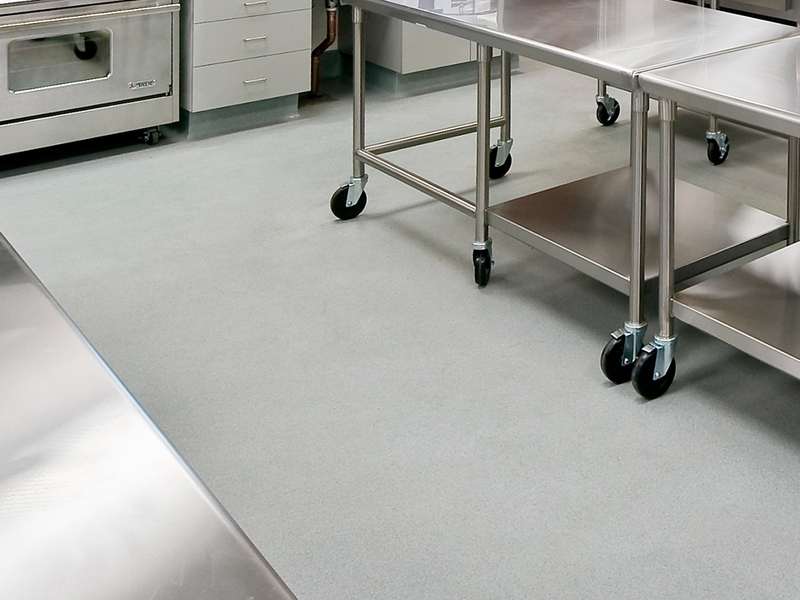 Why is heavy duty safety vinyl the ideal choice for commercial kitchen flooring? 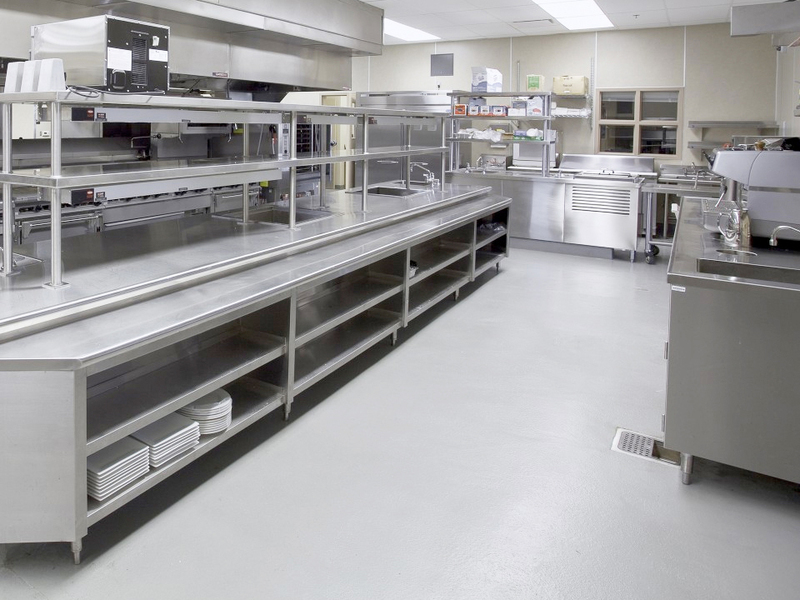 For commercial kitchen flooring we recommend safety vinyl because it will provide a safe slip resistant surface even when cooking oil, grease, fat or the occasional potato skin ends up on the floor. Vinyl safety flooring is suitable for all zones in a commercial kitchen including food preparation areas, cold storage, dry storage and pot wash.
Commercial kitchen vinyl flooring will create a seamless non-porous floor. The grout between ceramic tiles is porous making it more susceptible to harbouring bacteria. With commercial kitchen vinyl flooring there’s no grout involved. Instead, individual sheets of vinyl are heat welded together to create a seamless floor with water tight joints that leave dirt and bacteria with nowhere to hide. Our commercial vinyl flooring also has an extremely high impact resistance. Impacts that would chip or crack a ceramic tile have next to no effect on heavy duty vinyl floors. Cracked or chipped tiles allow dirt to collect and harbour bacteria. By creating a seamless, watertight environment from the floor to the ceiling, you can help minimise the areas in which bacteria will grow and where moisture can get trapped and cause damage to the subfloor. We’ve successfully installed flooring in 100s of commercial kitchens across the UK. Our hospitality clients include Experion UK, The Plough at Shenstone, The Crown (Alrewas), The Royal Oak (Kings Bromley), The Abbey, The Bank House, The Swan with Two Necks (Longdon), Holly Lodge School and NHS kitchens. Please contact us for advice or a no obligation quote for your commercial kitchen flooring.